LDL-cholesterol (LDL-C) lowering by statin therapy has historically been the focus of guidelines for treating cardiovascular disease (CVD) risk associated with elevated blood cholesterol. 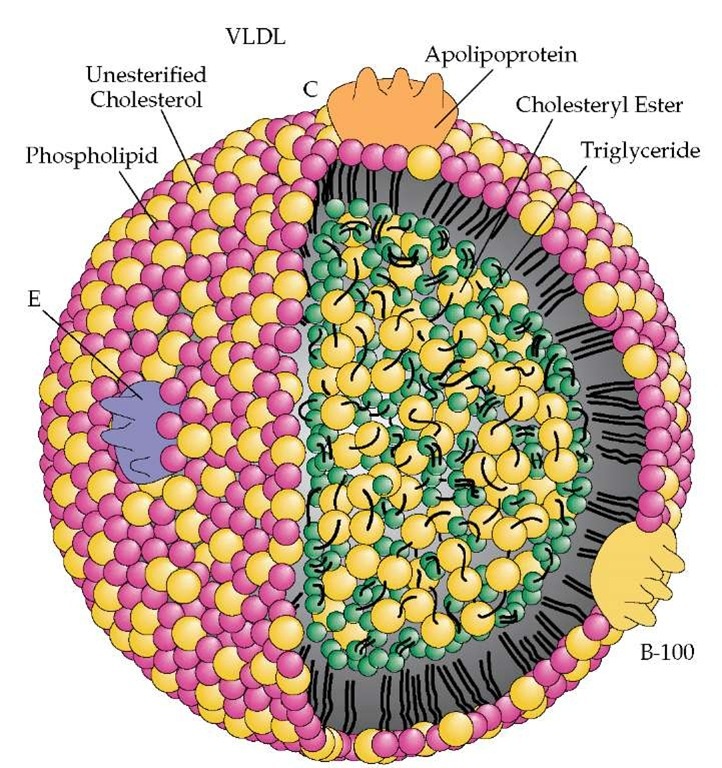 It takes 40-70% more cholesterol-depleted LDLs compared to cholesterol-rich LDLs to traffic a given level of LDL-C. A normally-composed LDL particle core has 4 times more CE than TG (a 4:1 CE/TG ratio). Smaller ratios indicate cholesterol depleted LDLs and the likelihood of higher LDL particle counts. The most common scenarios leading to CE-depleted LDLs and high concentrations of LDL-P are small LDL size (even small changes in LDL particle diameter translate into significant volume changes and TG-rich LDL particles). Patients with high LDL-TG (not typically measured) have CE depleted LDLs and higher LDL-P (regardless of LDL size). A large LDL with a low CE/TG ratio will be associated with high LDL-P and a small LDL with a low CE/TG ratio will usually be associated with extreme LDL-P elevations. Even with normal or near-optimal LDL-C measurements, LDL-P concentration may be increased. Studies have shown that elevated LDL-P concentration is associated with increased risk for coronary heart disease (CHD) even in the presence of optimal LDL-C values.8 Small, dense LDL particles are often associated with the metabolic syndrome and prediabetes. Statins are highly effective in reducing serum cholesterol through inhibition of HMG-CoA reductase, which upregulates LDL receptors (LDLr) and leads to increased clearance of LDL particles from the circulation. However, LDL receptors are not as effective in clearing small LDL particles compared to normal-sized LDLs. Statins are the most potent drugs available to reduce LDL-P, by upregulating LDL receptors and increasing apoB particle clearance, but do not generally influence the size distribution of the LDL particles. 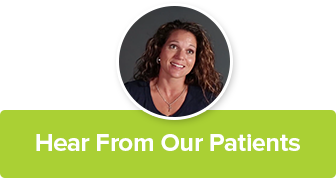 Therapeutic lifestyle changes can significantly reduce atherogenic lipoproteins and triglycerides and raise HDL-C levels (although neither are goals of therapy), resulting in decreased need for lipid-altering medications. NCEP ATP-III advises weight reduction, increased physical activity, and dietary changes that include reduced intake of saturated fats (< 7% of total calories) and cholesterol (< 200 mg/day), increased plant sterols (2 g/day), and increased viscous (soluble) fiber (10-25 g/day) have been demonstrated to be effective in reducing atherogenic lipoproteins. Kastelein JJ, van der Steeg WA, Holme I, et al. TNT Study Group; IDEAL Study Group. Lipids, apolipoproteins, and their ratios in relation to cardiovascular events with statin treatment. Circulation 2008;117:3002–3009. Davidson M. Is LDL-C Passed Its Prime? The emerging role of non-HDL, LDL-P, and apoB in CHD Risk assessment. Arterioscler Thromb Vasc Biol 2008;28:1582-1583.3. Sniderman AD. 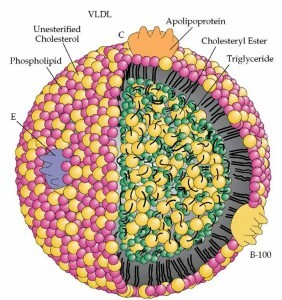 Apolipoprotein B versus non-high-density lipoprotein cholesterol: and the winner is. Circulation 2005; 112:3366–3367. Cromwell, WC, Otvos, JD, et al. LDL particle number and risk of future cardiovascular disease in the Framingham Offspring Study – implications for LDL management. J Clin Lipidol 2007;1:583-592. Grundy SM, Cleeman JI, Bairey Merz CN, et al. Implications of recent clinical trials for the National Cholesterol Education Program Adult Treatment Panel III Guidelines. Circulation 2004;110:227-239. Brunzell JD, Davidson M, Furberg C, et al. Lipoprotein management in patients with cardiometabolic risk. Consensus statement from the American Diabetes Association and the American College of Cardiology Foundation. Diabetes Care 2008;31:811–22. Davidson MH, Ballantyne CM, Jacobsen TA, et al. Clinical utility of inflammatory markers and advanced lipoprotein testing: Advice from an expert panel of lipid specialists. J Clin Lipidol 2011;5(5):338-367. Mora S, Szklo M, Otvos JD, et al. LDL particle subclasses, LDL particle size, and carotid atherosclerosis in the Multi-Ethnic Study of Atherosclerosis (MESA). Atherosclerosis 2007;192:211–7. Maki KC, Bays HE, Dicklin MR, et al. Effects of prescription omega-3-acid ethyl esters, coadministered with atorvastatin, on circulating levels of lipoprotein particles, apolipoprotein CIII, and lipoprotein-associated phospholipase A2 mass in men and women with mixed dyslipidemia. J Clin Lipidol 2011;5(6):483-92. Baumgartner S, Mensink RP, Plat J. Plant sterols and stanols in the treatment of dyslipidemia: new insights into targets and mechanisms related to cardiovascular risk. Current Pharmaceutical Design 2011; 17:922-932. Willett WC, Ludwig DS. The 2010 dietary guidelines – the best recipe for health? N Engl J Med 2011;365(17):1563-5. AIM-HIGH Investigators. The role of niacin in raising high-density lipoprotein cholesterol to reduce cardiovascular events in patients with atherosclerotic cardiovascular disease and optimally treated low-density lipoprotein cholesterol: baseline characteristics of study participants. The Atherothrombosis Intervention in Metabolic syndrome with low HDL/high triglycerides: impact on Global Health outcomes (AIM-HIGH) trial. Am Heart J 2011;161(3):538-43. Farnier M, Perevozskaya I, Taggart WV, et al. VAP II analysis of lipoprotein subclasses in mixed hyperlipidemic patients on treatment with ezetimibe/simvastatin and fenofibrate. J Lipid Res 2008;49(12):2641-7. Barter P, Ginsberg HN. Effectiveness of combined statin plus omega-3 fatty acid therapy for mixed dyslipidemia. Am J Cardiol 2008;102(8):1040-5. Effects of eicosapentaenoic acid on major coronary events in hypercholesterolaemic patients (JELIS): a randomised open-label, blinded endpoint analysis. Yokoyama M1, Origasa H, Matsuzaki M, Matsuzawa Y, Saito Y, Ishikawa Y, Oikawa S, Sasaki J, Hishida H, Itakura H, Kita T, Kitabatake A, Nakaya N, Sakata T, Shimada K, Shirato K; Japan EPA lipid intervention study (JELIS) Investigators. Lancet. 2007 Jul 21;370(9583):220.